Creating an appropriate exercise program to improve body composition — the relative proportions, by weight, of fat and lean tissue — can be challenging. The objective of any fitness plan is to eliminate fat and enhance muscle tissue, a process known as "toning." Resistance training for toning should focus on large-muscle, multiple-joint movements. Weight-bearing (standing) aerobic activity is also a key element in weight loss. A seated row engages the rhomboids (muscle under the shoulder blades), latissimus dorsi (lower side), posterior deltoids (back of shoulder) and biceps (front of arms). Sit with your hips at a right angle to your torso, which should be completely erect. Support your feet by placing them on the platform provided, and grab the straight bar with your palms facing down. Pull the bar toward you, flexing the elbows. Pull the scapulae (shoulder blades) together as the bar comes inward. Hold for a second once the shoulder blades are fully retracted. Bring the bar forward until your arms are straight. Repeat as desired. Machine squats work the quadriceps (front of thighs), gluteals (buttocks) and hamstrings. Machines designed for squats allow only vertical movement. Place the machine's bar or barbell across your shoulders behind the neck. Align your hips and knees, and position your feet in front of your knees. Start the lowering phase by bringing the hips downward, causing the knees to bend. Pause momentarily once you have created a right angle at the hip joint. Begin the resistance stage by extending the knees and elevating the gluteals until your legs are about straight. Avoid any overarching in the lower spine. Complete the desired number of repetitions. 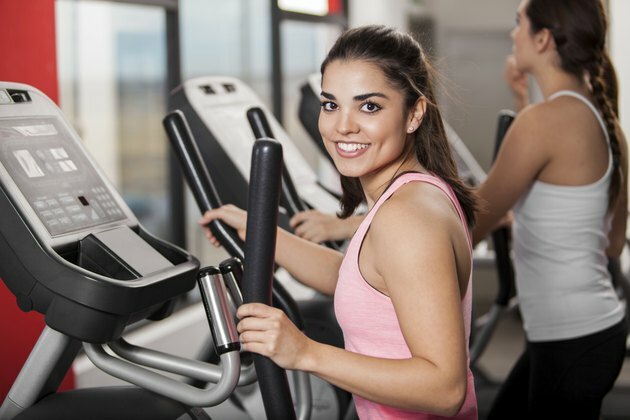 Elliptical machines provide a solid framework for the burning of calories key to weight loss. 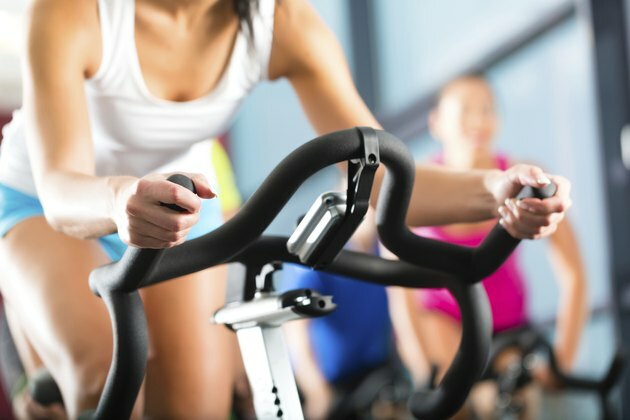 Ellipticals are weight-bearing, and usually provide an upper body/lower body movement combination — maximizing energy burning. Perform this type of cardio five or six days per week, 30 to 40 minutes at a time. 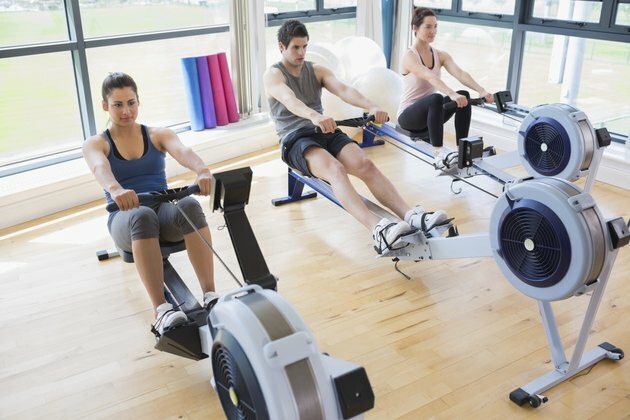 Intensity of the exercise is not as important as its duration. Aim for an intensity level of 70-75% of your maximum heart rate; calculate your maximum heart rate by subtracting your age from 220. For example, for a 35-year-old, the equation would be 220 minus 35, yielding a maximum heart rate of 185 beats per minute.